The Crib is a remodeled vintage corn crib, making it the perfect place for your party or event. 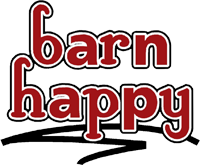 It is a separate building about 40 feet north of Barn Happy, which seats 50 people comfortably at tables and chairs. There is a bathroom, kitchenette, and long serving counter in The Crib, and it is insulated, heated, and cooled depending on the season. Whatever life event you want to celebrate in a unique setting!